MANSFIELD, Mass. 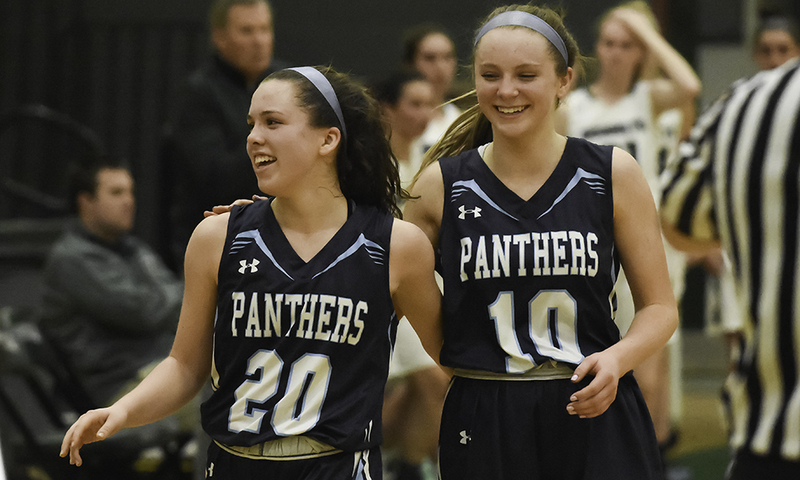 – The cliche is that defense wins championships and, if the cliche is true, then it is no wonder that Franklin had the chance to clinch a Kelley-Rex division title on Tuesday night. The Panthers came into the game against Mansfield in the Albertini Gym allowing a little more than 35 points per game, which was a league best. The game was a defensive struggle from the opening tip. It took nearly three minutes for either team to get on the scoreboard and the teams were tied at just 7-7 after one. Mady Bendanillo buried a three off an assist from her sister Kara to open the scoring, but Franklin was able to get the ball into the paint to star center Ali Brigham. The 6-foot-3 junior scored all seven of the Panthers’ points in the first and finished with a game-high 17, along with 10 rebounds and four blocks. The Hornets continued to hang right with the league leaders late into the second quarter, thanks to its own defensive effort. Mansfield is allowing fewer than 40 points per game this season as well. Emily Vigeant (nine points) scored on a drive and then drilled a three to put the hosts up 14-13 with only a couple of minutes left until halftime. “The tight start? Mike’s team plays great ‘D’. Bea was never open, Ali was hugged, and they just said beat us with someone else,” Franklin coach John Leighton explained. Franklin took control in the span of about 90 seconds. Freshman Olivia Quinn scored on an offensive rebound to get the lead back. Shannon Gray knocked down a three to extend the lead to four and then Brigham stepped into a transition three. Gray capped the half with a corner three off a Brigham kick out to open up a 10-point lead. Maggie Danehy (10 points and 13 rebounds) opened the second half with a jumper, but each time Mansfield got the lead back to single digits Franklin had a response. Megan O’Connell got a layup off one of Erin Quaile’s five assists and then Quaile drove to the rim for a basket. Sydney Mulkern hit a three to cut the lead back down to nine points, but Brigham scored at the rim and Quaile hustled to snag an offensive rebound and fed Bondhus (eight points) for an easy finish. The Panthers led 36-23 after three quarters. Neither offense clicked in the fourth but Mansfield was able to get as close as eight points (36-28) off a Mulkern drive. With Brigham in foul trouble, the Panthers were starting to rush against the Mansfield press and it looked like the Hornets might just have a chance to get back into the game. Following the timeout, the Panthers responded. Quaile scored, extending the lead to 11, and then Bondhus got free for the first time at the three-point lead to break the game open again. She buried a second three, the team’s sixth of the night, to put the game away. Franklin (15-1, 13-0) can clinch the outright title on Friday night when it hosts Taunton. Mansfield (11-4, 10-3) will try to keep up its push for a top-four seed in the Div. 1 South sectional when it travels to Oliver Ames.